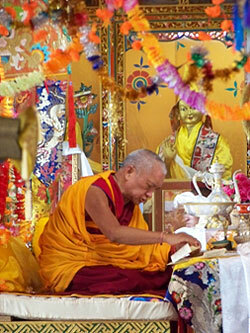 Lama Zopa Rinpoche at the Light of the Path teaching retreat, September 2009. You should do the daily practice of Guru Puja, even if you can’t do the sadhanas of many other deities, such as Chakrasamvara. Pabongka Dechen Nyingpo also mentions that when we do this practice we should think of the meaning of the words and meditate, not just recite the words blah, blah, blah, like an express train. As much as possible we should reflect on the profound meanings. Doing this definitely leaves an extraordinary imprint of the complete pure path to enlightenment. In this way, it makes it definite that we will achieve the very essence of life, which means that we will definitely achieve the essence of the happiness beyond this life up to enlightenment, and especially enlightenment. Doing the main practice of this Guru Puja is like hitting a target. When you shoot an arrow or gun or drop a bomb, your aim is to hit right on the target, your enemy or whatever you want to destroy. In the same way, this practice hits the right point in an effective way. So, you should attempt to integrate everything in this way. As Pabongka Dechen Nyingpo says, “One hundred waters are contained in Guru Puja.” He probably means that just as all the many streams from the snow mountains and other places go into the ocean, all the important practices of sutra and tantra are condensed here in Guru Puja. If you do this practice every day, you don’t miss anything. Since this is the very heart of the scriptures of the manifestation of the Joyful One, the blessing is unequaled by any other practice. So, it has great importance. On the basis of this, you then meditate on lam-rim and the tantric path of the main deity that you are practicing. This also contains all the important preliminary practices, the main one of which is guru devotion. Guru devotion is the root that enables you to receive blessings, the cause to achieve realizations of the path to enlightenment. Lama Zopa Rinpoche gave this teaching at Land of Medicine Buddha, California in 2001. It has been excerpted from Teachings at the Medicine Buddha Retreat, edited by Ven. Ailsa Cameron, recently published by Lama Yeshe Wisdom Archive. 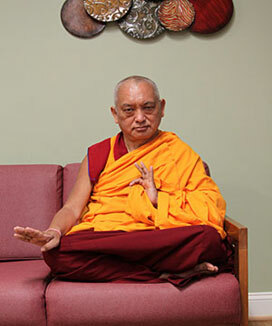 Rinpoche will be giving the Lama Chöpa commentary in Indonesia from January 25 to February 7, 2010. He will be giving detailed guidance on this critical practice over the next few years – students are strongly encouraged to attend. The correct chanting tunes are now available as a free download from the FPMT website! We are happy to introduce Sherri Rita who has joined our staff as Director of Development. Sherri will be coordinating our Friends of FPMT program and managing our other two main fundraising initiatives (Work a Day for Rinpoche and the Merit Box Project) while exploring other funding opportunities to support the actualization of the FPMT mission. As a former civil rights lawyer licensed in both California and Oregon, she will also be able to assist us with her legal expertise as needed. Sherri is an intermittent student of Maitripa College and brings a much appreciated enthusiasm to her new role. You will be pleased to see the exciting improvements made to Rinpoche’s video page by our webmaster, Adam Payne. He has redesigned how the video links are organized and how the player works. For instance, when you open the player there are now “Previous” and “Next” links which enable scrolling through the videos like an image gallery. Enjoy! Discovering Buddhism: Please remember when planning your 2010 programs to send Education Services your DB retreat dates! Many DB at Home students refer to the DB Retreats page of the FPMT site to find a FPMT center near them to fulfill their practice requirements. Living in the Path (Previously called Light of the Path): Note the latest name change! As Living in the Path (LP) will include much more than the content from the Light of the Path teachings in North Carolina, Lama Zopa Rinpoche has given this new name to better indicate the vision and intent of this program. The first modules of LP Online will be made available in February 2010. Remember, all of the Light of the Path teaching videos are now available to download. Buddhism in a Nutshell, a book and audio homestudy program (with Ven. Amy Miller) has gone to print and will be available in January. Education Services’ Heart Advice for Death and Dying, a commentary by Lama Zopa Rinpoche with an audio program by Ven. Sangye Khadro, has been adapted by Wisdom Publications for a more general audience. Entitled, Wholesome Fear: Transforming Your Anxiety About Impermanence and Death, the book is a pithy and powerful introduction to a challenging topic. Lama Chöpa tunes, as taught by Rinpoche, are now available for download from Living in the Path. During the Light of the Path retreat, Rinpoche very kindly lead each tune of the puja, sometimes offering a slow, medium and fast version. Note: some tunes are missing and this is not the puja in its entirety, but only one or two verses of each tune. Enjoy these very precious files! The FPMT Retreat Prayer Book used at the Mani and Light of the Path retreats in 2009 is now at the printers. This newest of FPMT prayer books will be used at all future retreats with Rinpoche and is advised for all personal retreats as well. All seven components of the FPMT Display Pack for center bulletin boards are now available in French! At the request of Maitreya Instituut Emst, two new promotional posters are now available in the FPMT Affiliates Area. Feel free to download these Basic Program and Discovering Buddhism posters for use at your next open house! Ven. Mindrol is going on retreat until April 15, 2010 and therefore your requests for materials may meet with delay. Please write to Merry for all requests and you will receive a response from Merry, Heather or Kendall. At the CPMT meeting, Rinpoche did an on-the-spot revision of his verse on the practice of compassion (which has since been further refined), and strongly suggested that it be put to use as a daily reminder for our actions. International Office used Kennedy Koh’s colorful design of the verse in our season’s greetings e-card. If you like that design as well, you can download the pdf for use as part of the Display Pack. FPMT Australia gave the compassion verses a completely different look and used it for a bookmark which they distributed at His Holiness’ event in Sydney. More words on the Display Pack: it gives instant recognizability to the center/study group/ project’s FPMT identity and visitors do appreciate having that information. Hopefully, you have already put it to use? Feedback on this is most welcome! Rinpoche arrived on December 5, and was greeted by all the 700 or so monks and nuns as well as a record crowd of 240 people attending the November course. The place was buzzing. Due to the large number of people, the November course was held in the main gompa this year, and the course students enjoyed having more room to spread out. stupa, making extensive offerings according to Rinpoche’s very detailed instructions, which culminated in each person offering of a butter lamp at the uppermost level of the stupa. The course group also sponsored electric light offerings at the stupa, creating a magical sight. Everyone was profoundly moved by this experience. 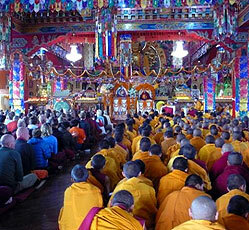 In the evening all joined in a Lama Chöpa puja and light procession. The annual FPMT Long Life Puja for Rinpoche was offered on the November 18 – it was a wonderful day, with the puja followed by picnic lunch, and the traditional offering of cham (monastic dance) by the monks from the tantric college. The day ended with an extensive book signing session in the main gompa, a great opportunity for many people to meet Rinpoche personally. Rinpoche chatted and told stories about his life and about Tibet, and gave some impromptu teachings till late into the night. We were also blessed by the presence of Serkong Dorje Chang, the incarnation of one of Rinpoche’s gurus. During his stay, Rinpoche attended the geshe examination of four monks, all of whom had completed their studies and were giving their debate examination. One of them was Thubten Jinpa, now Geshe Jinpa, who had attended to Rinpoche on his visits to Asia; another was Losang Sherab, the chant leader of Kopan. In March, during the Monlam celebration, these geshes will have to stand up to the challenges of the senior monks and geshes at Kopan. Pretty exciting! Rinpoche also met with the teachers of the new Kopan school, and gave extensive blessings to one of Kopan’s oldest monks, Geshe Kechok, who is now 92 years old and very frail. Rinpoche’s time was filled with appointments for course students (giving advice, changing the life direction of quite a few people) as well as meeting politicians and benefactors, monks and nuns, and many more besides. Not a minute of time was wasted, keeping all of us in awe and rejoicing in Rinpoche’s holy activities. The Parliament of World Religions was held in Melbourne in December 2009 – the fourth time in the modern era. The program of speakers was immense, and included His Holiness the Dalai Lama as the keynote speaker in the final plenary session. The Melbourne Convention Centre was a most colorful sight, with so many people dressed in the traditional robes of their various religions. Tara Institute’s Ven. Michael Losang Yeshe, Ross Moore and I were among the presenters, sharing a time slot with the Jewish Ecological Group from B’nai Brith. As we were facing the audience, we were all stunned and very honored to observe Ven. Samdhong Rinpoche quietly enter the room and sit in the back row during our presentation, which was accompanied by David Zinn’s spectacular video montage on the FPMT. The wish of many people was fulfilled when His Holiness the Dalai Lama consecrated the Jade Buddha for Universal Peace in Sydney on Tuesday December 1, 2009. Lama Zopa Rinpoche had advised that the Jade Buddha must be consecrated by His Holiness and the opportunity came when the organizers of Dalai Lama’s visit suggested the Jade Buddha be on stage at his teachings. 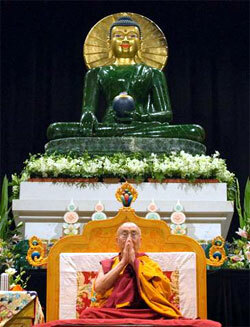 His Holiness bowed to the Jade Buddha at the commencement of each teaching session. 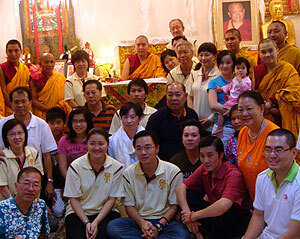 On his recent visit to Malaysia, Ling Rinpoche graciously accepted the invitations of the FPMT centers to teach there. At the Chokyi Gyaltsen Study Group in Penang, Rinpoche was requested to speak on an intriguing topic: how to enjoy samsara without feeling guilty. Daniel Yeoh, the group coordinator reported that Rinpoche clearly and precisely answered that samsara can’t be enjoyed. None to report this month.